Cut out 2 pieces of the leg in the colours of your choice and draw opposite lines on each leg in an angle. 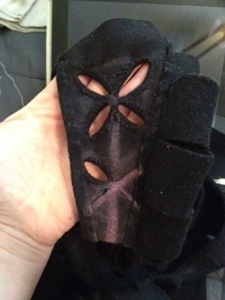 Note that the lines doesn’t goes all the way to the crotch; it will be more comfortable with less fabric between the legs and it will be easier to do the lacing holes for the codpiece if it isn’t to thick layers of wool to sew through. 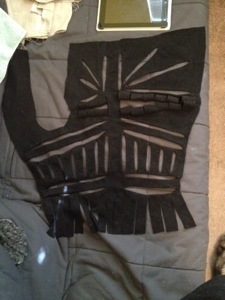 As you can see, the back mid piece doesn’t have any lines, that part is going to stay single colour. 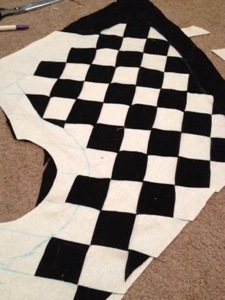 Pin the pieces and use basting stitches along the sides to keep them from not moving while sewing. 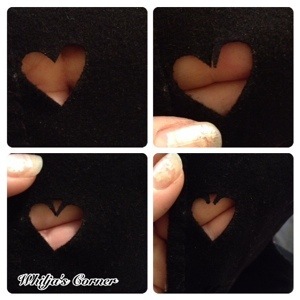 And cut off the extra fabric, giving you just a single layer all around the outer seams. 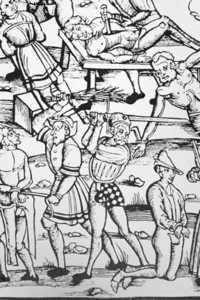 …and I’m not sure if the cutting will actually make it “fall” as the woodcut shows, or if I have to cut it differently. So I decided to keep it like this and cut it out as a tryout. 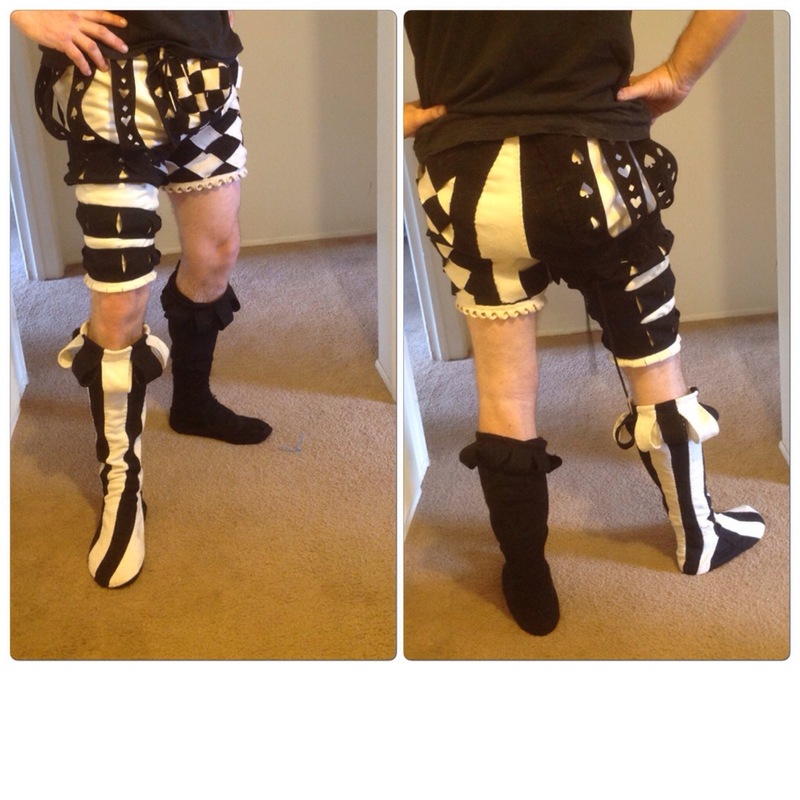 You can also see that I have simplified the pattern at the upper part of the leg, since I don’t want to ruin the fabric by guessing it wrong (It seems like the leg has a striped hosen underneath, but I’m going to keep that part single coloured this time). 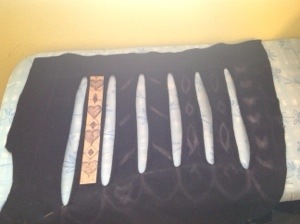 The leg has been slashed and I’m now working on finishing the edges by hand. 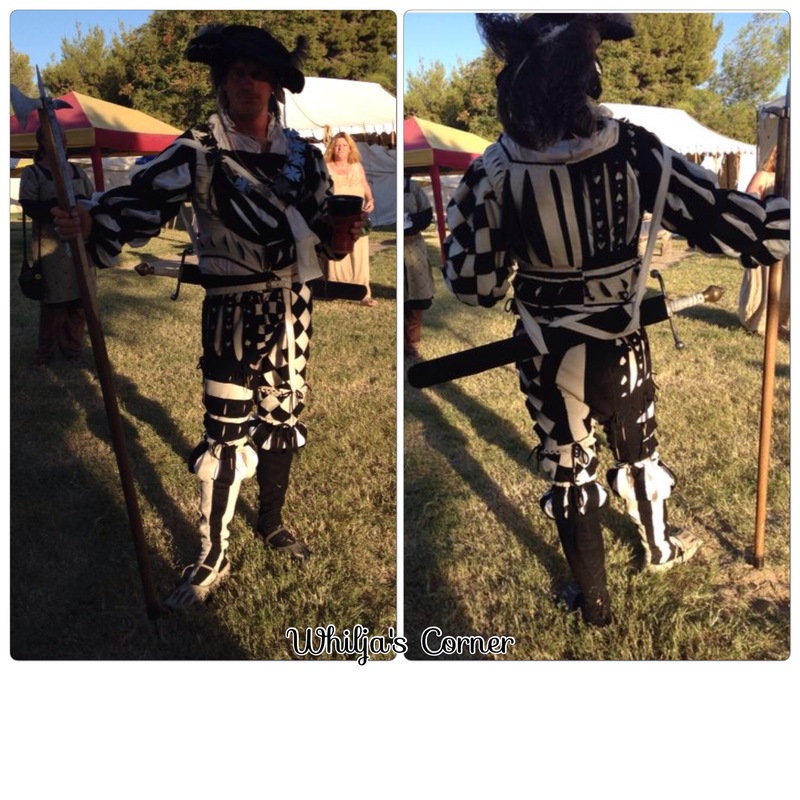 The slashed leg gets a white wool lining, same basic hosen. 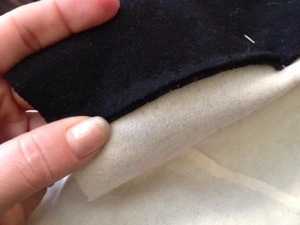 As you notice I finish the seam from the rigth side, the purpose of finishing is mainly to keep the seam flat since this kind of wool rarely fray and the hosen is going to have a linen lining anyway so the seam will be well protected from any stress. I cut out a short leg (around 10 cm below the but) and slashed it vertical (as the woodcut shows) and stitched the slashes on the backside to give the edges a smooth and proper look. I haven’t cut out the little flaps on the bottom yet, since I want to wait until I can try them on the person one more time, and make sure that the pants is the proper size. 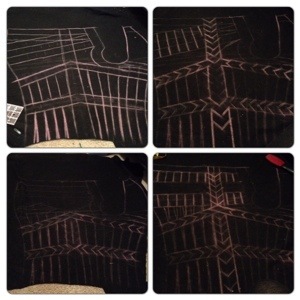 You can see different kind of pattern I’ve sketched on the backside, trying to decide which to use for the leg. It was my husbands idea to actually use hearts, and since it is hot pants, with one checkered leg, why not go with the gambling theme and make hearts and spades, divided by diamonds? 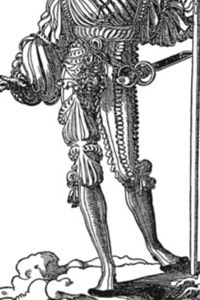 The shapes can be found on the woodcut above, a piece of fantastic garb that I would love to make in a future, until then, I will be inspired by the design and idea to use on my friends hot pants. 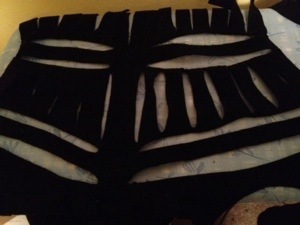 I usually use a template to be sure that the pattern is even, then just draw, cut and repeat. 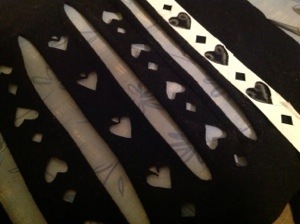 The spades are upside-down hearts where I cut a small triangle in the angle and the cut of some of the little “arms”. 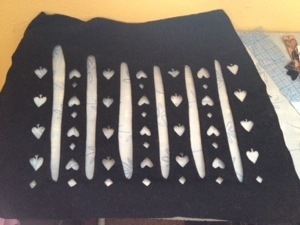 The right leg with hearts, spades and diamonds. 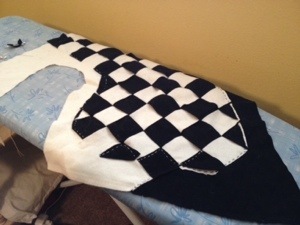 Adding the white wool lining, note that I try to keep the thickness down a bit by simply stick it underneath the folded seam. The I attach the two legs to each other (yay they fit! 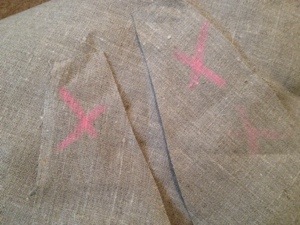 ), and cut out the natural linen lining on the bias (for stretch); they didn’t dye linen and a white linen would become dirtier faster then a natural. 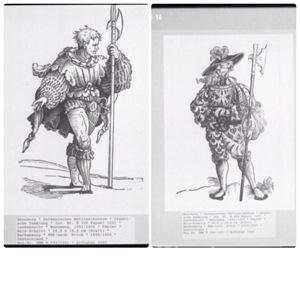 A natural linen would also be cheaper, and is therefore a perfectly period choice for a pair of Landsknechts hosen. to be sure I would end up with one left and one right leg, I carefully marked each leg with a big x, before I moved the fabric and started sewing. 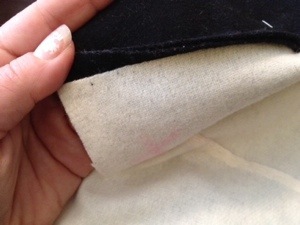 the seams are regular running stitch (with occasional back stitch), note on the left pic that the seam isn’t as narrow as a machine stitch; handsewing a garment actually give the seams a bit more movement and the seams can take a bit more stress before they brake. 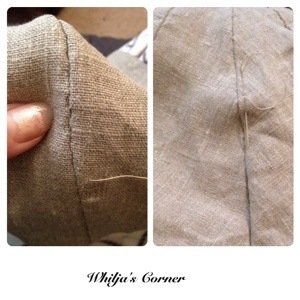 When finishing (right pic) I choose to just fold it (as I do with wool) and stitch it down. 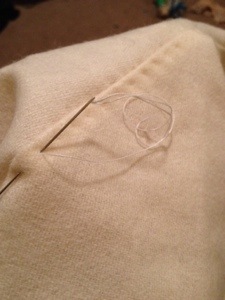 The linen is protected from fraying by the wool lining and just folding it once reduce bulgy seams on the back. 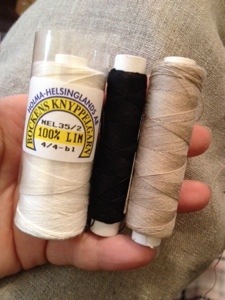 The excellent linen thread for handsewing is Bockens Knyppelgarn, and even though it is available in several different colours, I rarely use anything else besides black, white and natural linen thread size 35/2 or 60/3 (it’s kind of same thickness). 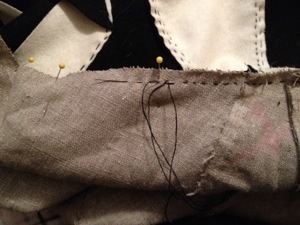 Then attach the linen lining to the wool pants, start mid back and pin (since bias cut has a tendency to stretch) and sew, repeat on the other side. 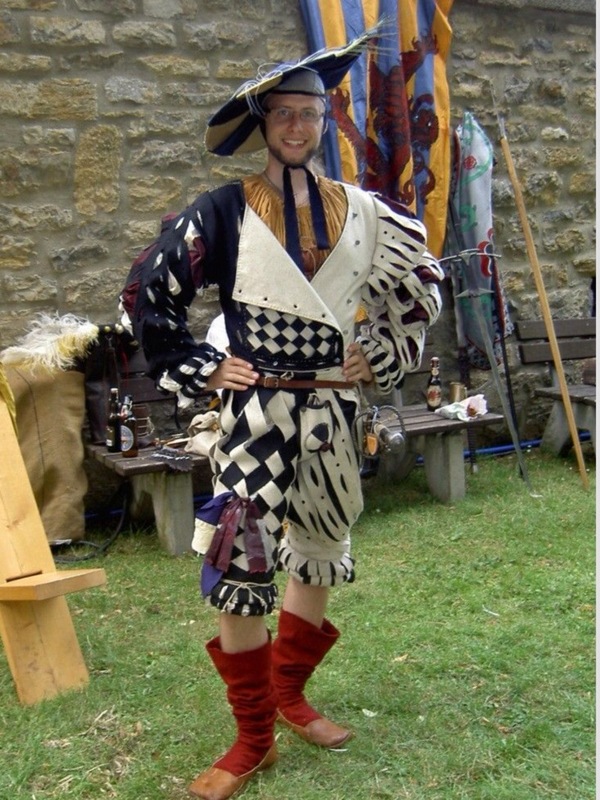 I need to do one last fitting, to see where to start the codpiece, and to make sure that the hosen are fitted nicely around the waistline, so I only attach the linen and wool around the waistline and down mid front straight section. 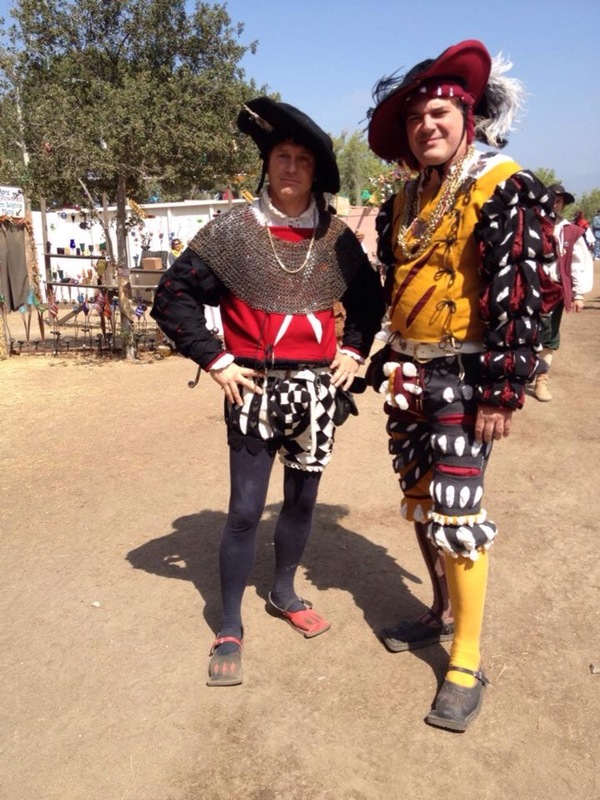 This entry was posted in Landsknecht, Sewing and tagged checkered hosen, Landsknecht, pants. I need to make an outfit for a friend, and this will be my first of the kind. 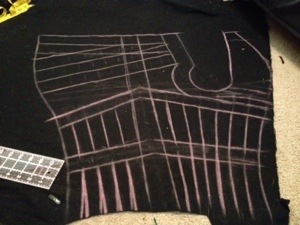 I think I have figured most of the steps out by now, but I am still very uncertain of the basic pattern used. 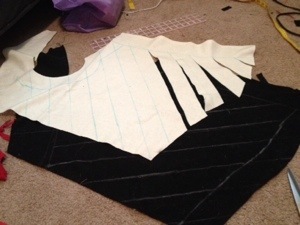 On the first picture, where you cut out the pieces for the legs and draw on them, I have a hard time figuring out how the basic pattern looks like. Can you elaborate on this part – is there some standard pattern you follow? You’re such a good friend! I’m sure he will be very happy for what you make for him. Your question is very valid; the basic pattern is a very large part of the construction, and the more time you spend with it, the better the end result will look like. 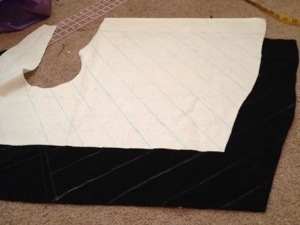 Most of the time I have to make a new pattern because of the different sizes my clients have, but when I start, I can easily skip a lot of steps by using an old template. I would also recommend to cut the mid back seam slightly more pointy, a pointed back seam seems to be more common (and the extra bias cut will help the stretch). It’s important to remember that the hose is higher then a usual pair of modern pants; it’s suppose to end at the natural waistline and not at the hips as most people wear today’s pants. I hope this helps some, please feel free to ask again if you need additional information. Thank you so much for the fast answer! And yes, I only need to make the hose to the knees :). I still find it very hard to understand which part of the pattern is which, and which parts go together (and which part is the back mid seam). It’s hard to decipher what has been written on them apart from the “x2”. The biggest pattern part must be the legpiece, and I don’t understand why it ends the way the does at the ankle, and what the long narrow piece at the right is doing. Excellent! Just let me know if you need anything else. How do you determine the size of the part of the pattern at the right side of your drawing – between C and the mid back seam? Hah! I don’t know how to edit a reply; *walking and sitting etc. 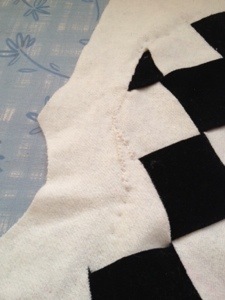 so I would probably recommend to not stitch it down agains the lining? Thank you for your response. The outfit came home a big mess after a long weekend and went into the wash. It was crazy looking after all of it, and now that I have it looking good again, I’d like to think of a way not to have the mess of twisted basket weave pieces happen again. Perhaps just a few tacking stitches here and there would work for me. Again, many thanks for your inspiration and advice.